January 23, 2019, 7:30 a.m.
President Erik Kolomaznik led the pledge of allegiance, and Richard Fox read a very timely poem about winter – with a very anti-winter twist. We welcomed several guests, Liesje Smith, Maria Horn, Maria McClellan, Carol Geske, Norm Silcox and guest speaker Adam Bunting. Regret to inform all those who love to read the Happy Fines each week, a technology glitch will prevent sharing that moment of fun this week. However we can report that Nancy Danforth’s lucky ticket was drawn from the basket, but she chose the wrong card and the pot rolls over to next week. Jessica Brumstead, co-convenor of speakers for CSH Rotary, introduced our guest speaker, Adam Bunting, Principal of Champlain Valley Union High School, and a member of the Vermont Opioid Coordination Council. Principal Bunting grew up in Shelburne, attended Shelburne schools and CVU. He was vice-principal of CVU, then principal of Montpelier High School and returned to be principal of CVU seven years ago. 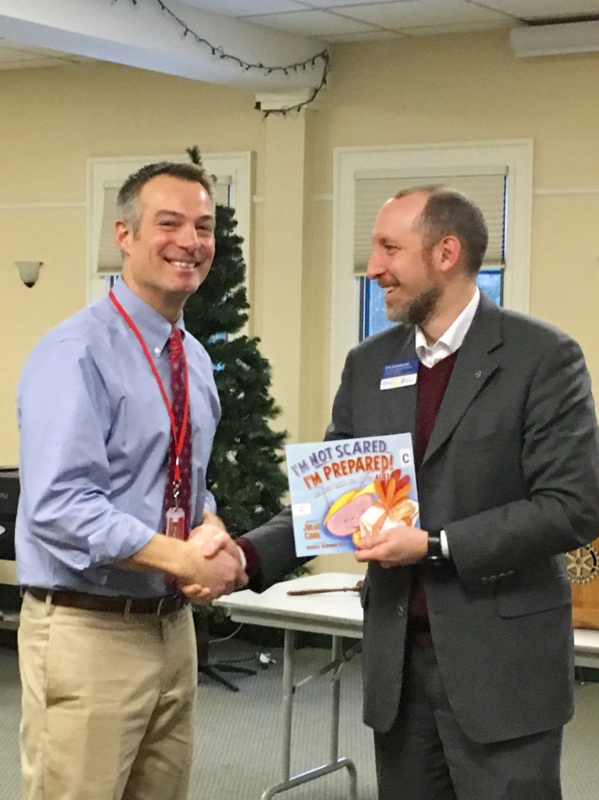 Jessica commented on his accomplishments including reaching out to the community with his newsletter for students and parents, and also mentioned that he was named Vermont Principal of the Year for 2018. Principal Adam Bunting explained the challenges and opportunities that are found in today’s high school student populations, and raised the awareness of his audience of the potential that exists for solving many of the problems facing young people by encouraging individuals to pursue their areas of strength and interest and avoiding the proscriptive, one-size-fits-all traditions of education. - in his English literature classes: literature is a record of things we have all experienced and therefore everyone has something to contribute; we should value that and find each individual’s strength as a contribution to building a better community. - an angry, defeated, struggling, substance abusing student was transformed by the experience of being welcomed to the wrestling team, finding himself surrounded by adults who understood and encouraged him. -- there is so much talent in our young people and we have to tap that to ensure that they recognize that they have a purpose in the world. - connected autonomy Is essential: more flexible paths to graduation, more leeway, a whole picture of a kid.